September 2nd in Wordpress Plugins by Wordpress Jedi . Producing great content for your website is important if you want to grow it. You also need to find ways to keep your readers engaged and encourage them to come back for more. Sending push notifications to your readers 0n their computer is one way to hold their attention. PushUp Notifications for WordPress happens to be a plugin that lets you deliver push notifications to your readers. 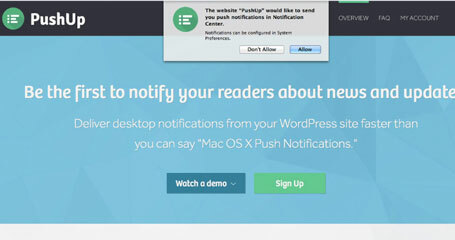 This plugin lets you grab the attention of your visitors with push notifications. It adds a “Send push notification” checkbox above your publish button, allowing you to pick when you would like to send a notification to your readers. The service lets you monitor engagement level to figure out how well your readers are responding to your messages. PushUp Notifications is mainly a premium service, but you get to pay as you grow. It does not require your Mac users to install any additional software to subscribe. You can get started for free.